Two teenagers design an elaborate social experiment to see if they can convince an elderly neighbor that his house is haunted. Terms and Conditions – September 18, 2014: Teenagers Ethan Fleming and Sean Turner explain “The Haunting Project” to the camera. Testing a theory about altered perception enabling people to see what they are looking for, Ethan and Sean design an elaborate social experiment to see if they can convince their disliked elderly neighbor Harold Grainey that his house is haunted. The Installation – September 19: While Grainey is out of his house, Ethan and Sean sneak in to set up surveillance cameras and various devices for their experiment. Inside, they find a padlocked door leading to the basement. The boys justify their actions to their girlfriends Ashley and Carly by repeating rumors that Grainey beat the wife who no longer lives with him. Lights Out – September 23: Ethan and Sean’s first setup involves remotely flickering the lights in Grainey’s house. The electricity surge inadvertently shorts an old alarm system, summoning police officer Christopher Todd Palmer. Grainey refuses to let the officer inside and dismisses him by explaining that the security system has not worked in 15 years. The next day, Ethan and Sean watch as a seemingly angry woman leaves an envelope on Grainey’s doorstop. They assume it is his disgruntled ex-wife. The day after that, Grainey has a tense encounter with a neighbor walking his dog. Knock Knock – Ethan and Sean rig Grainey’s back door to repeatedly open and shut. The banging reminds Grainey of a conversation he had with his wife about the door. The constant door noise eventually leads Grainey to destroy it with an ax. Moonlight Sonata – Ethan and Sean remotely turn on Grainey’s record player. The song reminds Grainey of time spent dancing with his drunken wife Carrie. Sean finds something surprising while closing windows on Ethan’s computer, but says nothing about it to his friend. Ethan and Sean both wonder what Grainey could have been doing when he disappeared into his basement for seven hours overnight. Cold Spots – Ethan and Sean lower the temperature in Grainey’s bedroom and crack the window from the cold. The now broken window reminds Grainey of an encounter with a younger woman in the same bedroom. Desperate to discover what is in the locked basement, Ethan plants a hidden microphone to record audio from Grainey’s porch. The Basement – The boys call the Ashland P.D. to report hearing a woman screaming in Grainey’s basement. Seemingly confused, Grainey allows Officer Palmer access to the basement. Palmer investigates and leaves shortly thereafter having found nothing to indicate criminal activity. Sean tells Ethan he found an incriminating email on the computer revealing a strained history between Ethan’s father and Grainey. When Ethan’s father beat Ethan’s mother, she went to Grainey for help and the old man became the chief witness against Ethan’s father. Ethan blames Grainey for his parents’ divorce. Suspicion arises that Ethan’s prank may actually be a revenge plot. Halloween – Ethan secretly watches Sean hook up with Carly at a Halloween party. Sean finds out, leading to an angry confrontation between the two friends. The Lock and the Bell – November 1: Grainey’s cat knocks over the living room surveillance camera. Over Sean’s protests, Ethan goes to Grainey’s house with a gun to reset the camera. Ethan finds the basement door unlocked and allows his curiosity to lead him downstairs. He finds a table with a bell in the center. Ethan picks it up and the ring wakes Grainey. Ethan moves the bell upstairs, locks the door, and hides. Armed with his own gun, Grainey unexpectedly shoots himself after seeing the bell inexplicably moved to the table. Sean rushes over to help Ethan remove their equipment and move the body, but they are arrested in the act by Officer Palmer. Flashbacks reveal that Grainey’s wife Caroline died of cancer. The other woman seen in his bedroom was a nurse dedicated to Carrie’s care. The woman leaving papers on his doorstep was a relative attempting to move Grainey to a communal living facility. The bell was a gift given to Carrie so she could summon Grainey when needed. The basement was a shrine to her memory. Grainey came to believe that his deceased wife was indeed a ghost haunting his home. The Verdict – Sean and Ethan are sentenced for their role in Grainey’s death. Although the judge wishes to impose a harsher punishment, the teens can only be sentenced for misdemeanors amounting to two years of probation and 500 hours of community service. An angry mob awaits the boys and their families outside the courthouse, but Ethan becomes transfixed by the surrounding cameras and media attention. NOTE: "The Good Neighbor" was previously titled "The Waiting." Ethan and Sean have a possibly clever, possibly cruel idea for a unique social experiment. With a suite of surreptitiously placed surveillance cameras, and enough smoke and mirror rigging to be David Copperfield stagehands, the two teens set out to see if they can convince irritable old neighbor Harold Grainey that his house is haunted. Their plan is part prank, part revenge plot, and all kinds of ill-advised as Ethan and Sean gradually discover Grainey may not be the easy mark they presume him to be. Grainey keeps a secret padlocked in his basement. And maintaining that mystery makes the reclusive hermit react to purported paranormal activity in ways that are alarmingly unexpected. 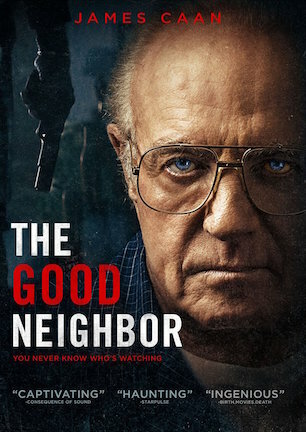 “The Good Neighbor” is not entirely the thriller initially expected based on its simple synopsis. Semi-describable as a modern take on “Rear Window” with a technological twist, more elements of dark drama make their way onto the screen than do typical trappings of straight horror or suburban suspense. Most of the movie is structured as “found footage” featuring Ethan and Sean outlining their actions for imaginary viewers and logging daily diaries to record reactions. Director Kasra Farahani then flips the “happening now” first-person format by intercutting past and future interludes. Flashbacks fill in the blanks of memories in Grainey’s mind when the boys unleash various bumps in the night. Flash-forwards look ahead to an unspecified ending that sees the story concluding in a courtroom. Farahani’s choice to hint early and often at the courtroom climax is a curious one not always in the best interest of fostering nail-biting intensity. “The Good Neighbor” wants its audience bracing for an inevitable tragedy so the hi-tech hijinks foreshadow a grim outcome. But an inherent expectation of something awful ahead is already included when watching a movie whose premise and tone suggest it is unlikely to end in a three-person group hug. One setup in particular asks for suspicion that a certain person is in fatal danger, except a previous scene deflates that balloon by revealing the character’s safe and sound participation in the upcoming finale. It’s impossible to expect a potential ax to the head when that head is previously confirmed as coming away completely intact. That doesn’t mean “The Good Neighbor” is devoid of suspense. Instead, the atypical thriller style derives tension from feelings of perpetual uncertainty rather than a sense of constant danger. What lurks in the basement, what lands the boys in court, and what ultimately happens to Grainey are ongoing mysteries keeping intrigue high, even when knowing the names of those seeing things through to the end. In this case, visceral exhilaration is not a requirement for the plot to remain engrossing. Maintaining that momentum is a trio of outstanding performances from the three leads. Logan Miller and Keir Gilchrist essentially play extensions of their respective characters from “Scouts Guide to the Zombie Apocalypse” (review here) and “It Follows” (review here). Miller’s motor-mouthed jackass provides the comic relief yin to Gilchrist’s nebbish nice guy yang. Their particular personalities along with their chemistry together keep juvenile antics and attitudes entertaining, occasionally even endearing, when differently tuned characterizations could easily make them obnoxiously tiresome. Making a mountain of a character out of a molehill of screen time, James Caan puts on a powerhouse demonstration of how a veteran actor ably elevates a seemingly small part through subtleties evenly in step with juggernaut screen presence. Caan is as engaging as ever in an uncharacteristic role. His gruff tough guy persona is always in play, but he fires up a fragility underneath that humanizes Grainey in an unanticipated manner. Whether the character intends to elicit enmity or empathy, Caan masterfully flips switches that can inspire disapproving headshaking or pull sympathetic heartstrings with equal ease. By conventional definitions, “The Good Neighbor” is neither a traditional “found footage” film nor a standard suspense movie. Its true status stands as a dramatic parable about the dangers of desiring social media celebrity and the potential damage done by becoming “YouTube famous.” That theme is overdramatized by the ending, though it is no less timely as a cautionary tale concerning internet-era bullying with an unlikely target at the center of its story. Points are deducted for including flash-forward interruptions subtracting from suspense. Others may dock more for a final message that can be seen as sensationalized. But committed acting carries the drama to a finish line finding “The Good Neighbor” winning out as a compelling character study as well as a thoughtful thriller. March 25, 2016 by Ian Sedensky.